Apples are in abundance in the souk nowadays. Specifically those apples that are a bit beaten up and bruised. Not the ones you would want to bite into for a snack. The sit in little piles to the side of the other fruits, with their banana friends who are a little more brown than you’d prefer. Most people pass them by without a second thought. Who wants to buy beaten up bruised slightly old fruit anyways? Slighly beaten up apples- hellloooo apple butter/apple sauce. My stove is a little finicky, so depending on the day i’ll have apple sauce or apple butter. Some days it likes low heat, some days it’s doesnt. Luckily, I am happy with both stirred in my morning oatmeal. Or in this case, smeared into my cinnamon rolls. Here’s a recipe i LOOSELY used. I like to add more spice to mine. More cinnamon and I throw a couple teaspoons of Pumpkin spice mix in. This weekend I had some overnight guests that were passing through our city. It’s been a while since I have made cinnamon rolls, and after making a carmel apple version last fall, I wanted to play with adding apple butter to mine. Pinterest told me it was a good idea. And Pinterest is generally right. Follow it exactly. Don’t cheat on the rising time. You’ll be sad. After I have the basic dough made, that’s where I began tweaking things. Followed by a smear of apple butter/sauce. I added a little more cinnamon and sugar to top it off before rolling. This original recipe says this makes 12 rolls. I normally get 16 medium sized ones that are similar in sized to store bought rolls. Rolled, cut and placed in the fridge overnight. All you need the next morning is 30 mins of rising time and 20-30 mins in the oven, and a drizzle of maple glaze. Heat milk over medium heat, just until bubbles begin for form on the surface. Remove from heat and stir butter in until melted. Allow to cool until only slightly warm. Stir in yeast, sugar and a pinch of salt. When yeast is dissolved, allow to sit for approximately 5 mins. Add eggs then flour, 1/2 cup at a time. Mixing between additions. When the dough begins to come together, and form a ball, place onto a flour surface and knead 8-10 times. Liberally oil a metal or glass bowl and place the dough inside. Cover and let rise for 1-1.5 hours. **Here’s my no fail trick to getting your dough to rise. While you heating your milk, turn your oven on to 350 degrees. Allow it to preheat for 5 mins, and then turn it off. When your dough is ready, place the covered bowl into the oven (which is now turned off) and allow it to rise for 1 hour. The heat allows it to rise, and the closed spaced keeps cool drafts of air away. After the dough has risen, place is on a floured surface and roll out into a rectangle. It should be about 13-15 inches long and 8-10 inches wide. Depending on how thick you want your layers. Brush with your melted butter. Making sure you get the edges. Leave a little extra butter, we will use it to grease the pan. Spread the apple butter on the dough. Sprinkle the cinnamon and the brown sugar. Slice the roll with a sharp knife into 12-16 rolls. They should be between 1.5-2 inches wide. It just depends on how many people you want to feed and how huge your want your rolls. Place in a greased baking dish. Dont overcrowd it. Let the have a little room to expand. The next morning remove the rolls from the refrigerator, and allow to rest and warm up for about 20-30 mins. Place rolls in a preheated 350 degree oven and bake for 20-25 mins. Until the tops are golden brown. Allow the cinnamon rolls to cool while you are making the frosting. Combine the powdered sugar, maple extract and milk. Starting with 3 tablespoons and stir. Add milk by the tablespoon as needed, until the consistency it just pourable. 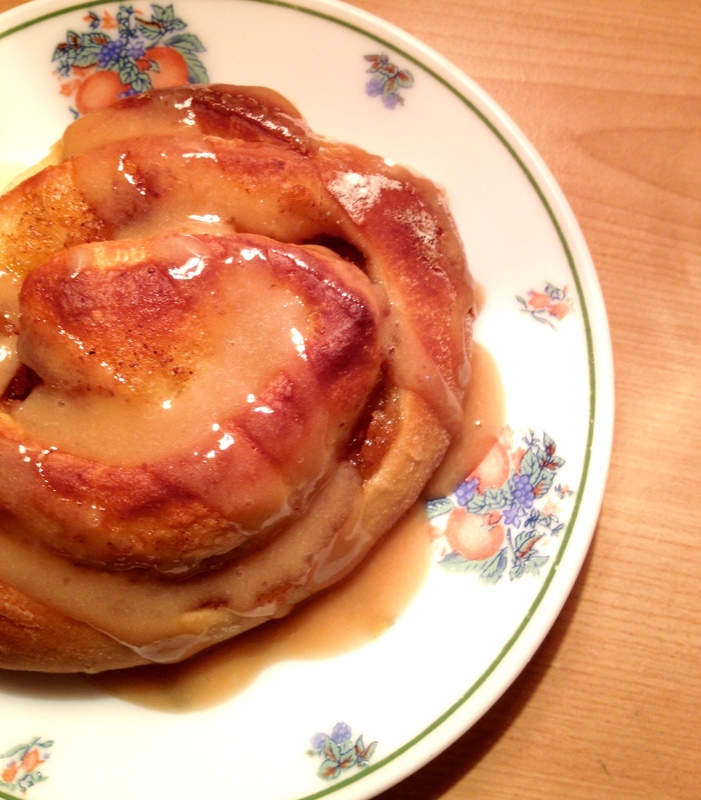 When the cinnamon rolls have cooled slightly, drizzle the frosting over the rolls.